For all of the new people coming in from Con Alt Delete, welcome and thank you for joining Albert the Alien. For all of you returning to Albert – welcome home. The object has finally arrived, and it’s calling out to Albert the Alien! 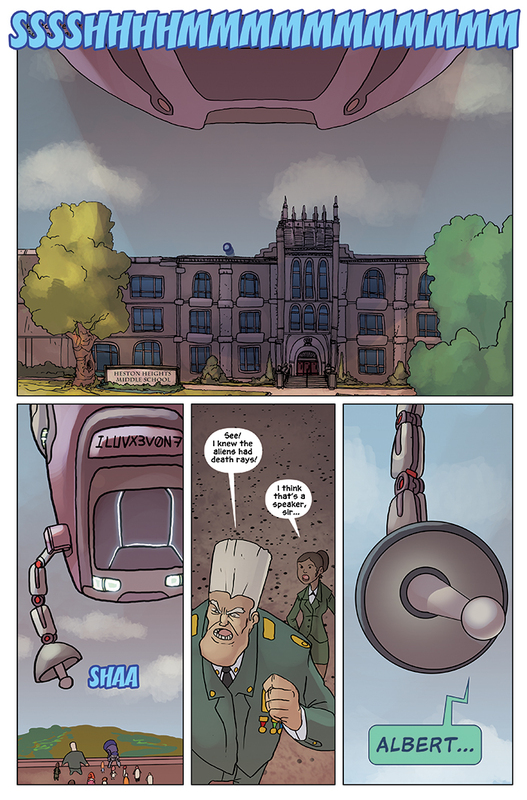 The giant object hovers over the school – it’s a ship of some kind – with robotic limbs coming out if sporting something that Col Ty Fighter believes to be death rays! But we know from Albert’s previous statements that life in space cherishes life, so they don’t have any death rays. It appears to be a speaker, and it’s calling out to Albert the Alien! What could this ship possibly want with him? In fact, doesn’t this ship look a little familiar? It does have that familiar bumper sticker, after all. Only three more pages remain for this story arc! Be sure to check out the next exciting installment of Albert the Alien, updating every Wednesday and Friday!